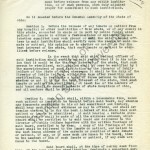 The eugenical sterilization laws passed in the United States at the beginning of the twentieth century were written to apply to the “unfit.” The category of the “unfit,” as seen by many prominent American eugenicists (including Harry Laughlin, as evidenced in his “model” sterilization law), was composed of people who depended on state assistance for part or all of their subsistence and who eugenicists felt were a drain on society. Among the “unfit” were the insane, the “feeble-minded,” the blind, the deaf, those afflicted with syphilis, tuberculosis, and leprosy, orphans, and others. The largest numbers of people sterilized were those classified as insane or “feeble-minded.” While a large number of those who were sterilized came from state institutions, eugenical sterilization laws were not exclusively limited to persons residing in these establishments. 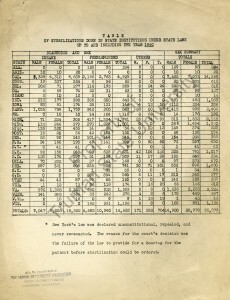 Data compiled by the Human Betterment Foundation of Pasadena, California, showed the numbers of people who were sterilized up to the year 1940, organized by gender, reason for sterilization, and state in which the sterilization occurred. The disparity between the amounts of women sterilized and the amounts of men sterilized showed that far more women were sterilized than men. Also of interest are the data concerning New York. 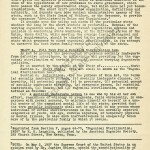 The New York law was declared unconstitutional because it violated due process, the very aspect Harry Laughlin sought to correct in his “model” sterilization law. 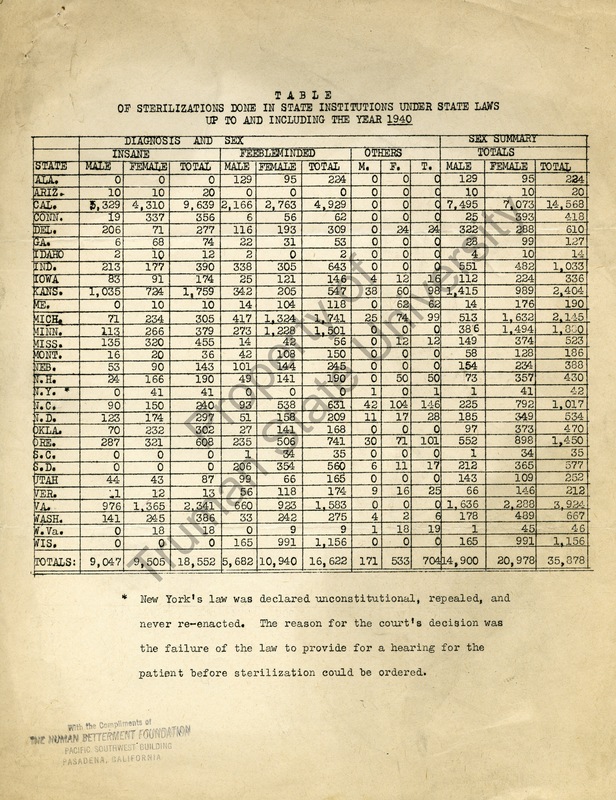 Image Source: Human Betterment Foundation, Table of Sterilizations Done in State Institutions Under the State Laws Up To and Including the Year 1940, Harry H. Laughlin Papers, D-4-2:11, Pickler Library, Truman State University, Kirksville, Missouri. Copyright © 2019 Harry Laughlin and Eugenics All Rights Reserved.